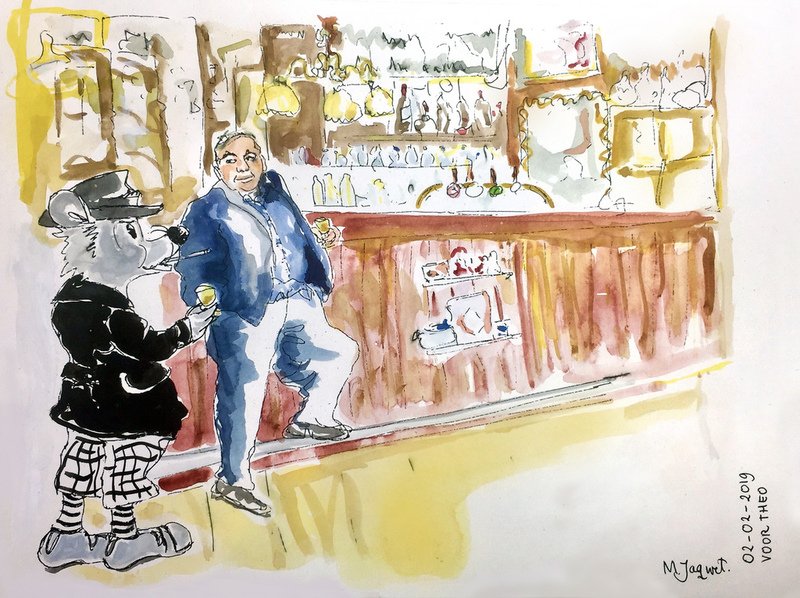 Theo Bouwman (publisher of the Dutch magazine Argus) is having a drink with Argus (the cartoon character after whom the magazine was named) at the bar of Café Scheltema. It was an honor and fun to make this drawing, a present from his colleagues for his 75th birthday, especially as I am working for this magazine from the very beginning, almost two years ago now, making drawings of all kinds of people, mostly in Amsterdam but sometimes from other places, for the back page of each issue. here (a new series, from issue 32). Posted by mjaquet on 2019/02/04 in drawing & painting, magazine, portrait, present and tagged ARGUS, assignment, drawing and painting, present, publisher, theo bouwman.